The book 1984 by George Orwell was required reading in my high school in 1985, at the very least suggested, difficult to recall exactly as it has been 33 years ago now. Although George Orwell was a nom de plume, or, pen name, as his reported birth name is known by some to be Eric Blair. I know this because it is documented in the book itself. What the manuscript did not imply however is the knowledge that Mr. Blair was not only in service to the Indian Imperial Police, or that 1984 was possibly the most significant book of the 20th century, but that MI-5, or British Intelligence, had him under surveillance since 1929 until his passing in 1950; seemingly because of the content of his writings and personal views on society. This information has been declassified by the National Archives. Point being, he knew what time it is, and what time it is going to be unless and until the good people of this world do not themselves change the course of which we are now rapidly moving towards. The book is titled 1984, however it was first published in 1949 right before his strange passing over in 1950. There are several theories as to why the title 1984, yet these seem to be the most shallow and readily provided. I am inclined to suggest that 1984 is reminiscent to the 100 year anniversary to the founding of the Fabian Society in London, which was in 1884. 100 year marks seem very important to the so called elite and others, such as we see with the purple revolution being promulgated currently, which happens to be exactly 100 years since the Bolshevik Revolution which started in Russia in 1917. As in the color purple, Deep Purple, the artist formerly known as Prince, and the Purple Rain. This is because the color purple rings with the highest vibration and precisely why the color of so called “royalty,” is also purple. With 1984 Mr. Blair was known to have been feverishly working to get this book completed as his health was evidently failing at the young age of 47. It is very apparent to me now that sadly ones work is not fully appreciated, nor even realized many times until after they pass on, such is the same with George Orwell. This is a shame, for if the masses would turn their attention to the wise sooner, the world would be a much different place. Although the term “Orweillian” is being used much more frequently now, even being somewhat defined in the Webster’s “New World” dictionary, most people I surmise have no idea what the term implies and even less of what the book details. I remember reading it several years back and a younger person aged around 21 or so exclaimed to me this was her favorite fiction book. If only that were true, the part it being fiction and all. I often wonder if she has been able to connect more dots and sees things a bit more clearly now. I have read the book numerous times now throughout my life and what he foretold in these pages over 67 years ago is eerily similar, and perhaps far beyond even what he had then anticipated as our future. He envisioned a world of thought crimes, thought police, newspeak, double speak, cameras, monitors, detectors, citizen against citizen, false flags, the destruction of language, vocabulary diminution, and illogical math such as 2+2 equaling 5 (common core that is being implemented now). Ms. Iserbyt was the Senior Policy Advisor in the U.S. Department of Educational Research and Improvement. She Authored the book, The Deliberate Dumbing Down of America. George Orwell’s vision of our society in 1984 told of enormous tele screens, even plastering the streets, showing sports and other ridiculous circuses which continually emitted lies, propaganda, and other vapid nonsense that somehow kept the people fascinated and or brainwashed. This was well before the advent of any type of television screens were available to the public mind you. He wrote of a world full of ignorant people completely under mass hypnosis immersed in sports games and speaking gibberish, their words reduced to unintelligible slang which was all deliberately promoted and designed to diminish the range of their thinking. Because see he knew, when you abbreviate words you also abbreviate, and do not complete your thoughts which reduces levels of understanding. Of course they themselves were not aware of this as they continued to grunt and utter incomprehensible jargon, seemingly relishing in their own doltishness. He imagined complete and absolute control of every world citizen, even their private activities, by a tyrannical force that had a goal of world destruction. He wrote of Constant and Terrible wars that kept the populace in a perpetual state of anxiety and fear with entire departments of state that were tasked with completely fabricating and rewriting history. A time where school children were only permitted to regurgitate what they were told and where words were made “nicer.” In 1984 every citizen was under constant surveillance having exactly no privacy at any time, terrified to speak anything that did not support the party line. Remembering it was written in 1947, and even centuries prior, by numerous enlightened individuals. As we look around today what do you see? As Erich Fromm points out in the afterword of 1984, the information in the book was meant to be a warning to the human family. There are powerful messages within these pages directed at our supposed leaders, peace officers, mothers, fathers, brothers, sisters, to anyone halfway conscious that they better look up and look about themselves before it is to late. To take immediate notice of the systems they are in service to and begin to question the morality of the stated goals, agendas, and the egregious actions necessarily foisted upon the people to accomplish them. We are living in the direct center of the universe that Mr. Blair outlined for us over 67 years ago and not many see it. They do not see it because they have nothing to compare anything to, precisely like the once crystal blue skies which are now grey and dark from another agenda. Full spectrum dominance of every single thing on this entire planet and all the others as well it seems. They do not see it because they do not want to and think that ignorance is bliss, or even worse, let the tele screens and other imbeciles on “social” media sell them what reality is, but at least they have 10 million friends! The few that do and realize where we are headed, well, they are “just doing their jobs,” don’t you know. This of course is akin to selfishness and of exactly cowardice as well, presumably to petrified to look for another line of work that would actually promote and elevate the human family as opposed to assisting in destroying it. Our silence, is our consent. It gives consent to the most calamitous future one can possibly fathom if we continue on in this despicable manner as the supposed most intelligent life forms on the planet. Man cannot unsee the truth, and as Aristotelian philosophy shares with us through his wisdom, for good is simple, evil is manifold. We will leave the astute reader with a few passages out of the book itself and a small portion of the afterword written by Erich Fromm. ‘In the end the party would announce that two and two made five, and you would have to believe it.” Pg. 69, 1984. 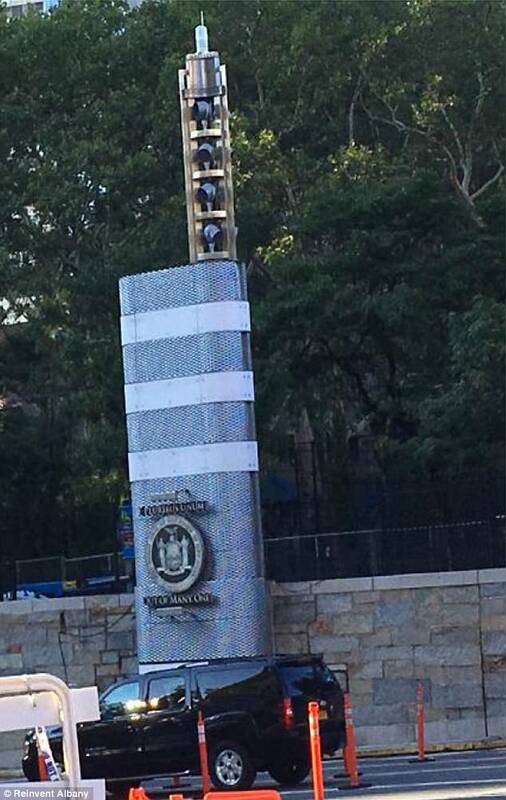 POLICE STATE: 100 MILLION DOLLARS SPENT ON MYSTERIOUS ORWELLIAN TOWERS ERECTED IN NEW YORK—MTA PLEADS THE 5TH AND IGNORES CITIZENS..